Yesterday, I spent time with my Grandma Jean, even though she died seven years ago at the age of 100. How is this possible? It all began in the morning when, after deciding to bake a challah, I went in search of a vintage recipe in my collection. I figured my best chance was in one of the recipe collection books I recently took from my mother's kitchen. After looking through several and finding not one challah recipe, I opened a spiral-bound book of recipes contributed by members the Akron chapter of B'Nai B'Rith Women. Bingo, I found a recipe -- but not just any recipe. I couldn't believe my eyes when I saw that the contributor was none other than my grandmother, Jean Glauberman. When she died in 2005, I thought her recipe went with her. That's because she really had no recipe. When I'd ask, she'd say, well you start with a five-pound bag of flour, at which point (and this was way before I became a fearless baker) my head would start to spin and brain become as cloudy as a flour storm. Of course, I set out to make it, and you should too. 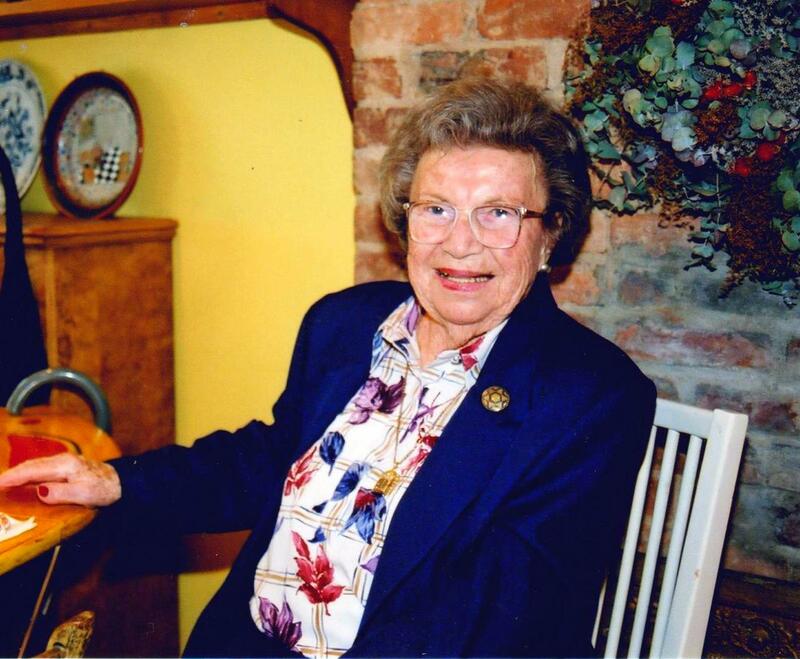 Though it is not as rich as many challah recipes (Grandma Jean, pictured below in 2002, was too frugal to use more than two eggs, for example), it's really quite good. My brother reminded me that she used to add a drop of yellow food coloring to her challah, I realize now, to give the appearance of an egg-ier, richer bread. She also used this dough as the base for many other breads (onion bread, hardtack, etc.) -- see the recipe above, which I'm sure she dictated to someone. I can just hear her say: Or make rolls, or whatever. Want to give this a go for the Jewish New Year? Make a well in the middle of ten cups of flour. Add one package of dry yeast and pour a little warm water over to cover it. Wait five minutes, until it begins to foam a bit. Add the rest of the ingredients, as indicated on the recipe -- BUT, the four quarts of water is definitely wrong. Start with two cups and add more as needed. Then, knead the dough on a lightly floured surface. When smooth and elastic, place in a bowl and cover until it doubles in size. Note to self: Next time, use a bowl large enough to accommodate the dough. This recipe makes two large loaves. For the the first one, I just formed a ball, placed on a baking sheet and brushed with an egg wash (a beaten egg). I baked it in a preheated 350 degree oven for about 35 minutes. It will look like this, when it's done. For the second loaf, I decided to get fancy as Grandma Jean did and braid the challah, but in a round shape in the New Year tradition. For instructions, I turned to Smitten Kitchen, the mother of all food blogs. Click here to learn how. You can see illustrations below. I really like challah bread. Your Grandma's recipe looks so simple too so I will have to try this. Thank you for sharing. It brought a tear to my eye when I read you found not only a challah recipe, but your grandmother's recipe. There is something so special about the tradition of a family recipe - even when the recipes are "approximate" (as I found with my grandmother's recipe for cinnamon rolls). Looks good enough to eat right from the photo. 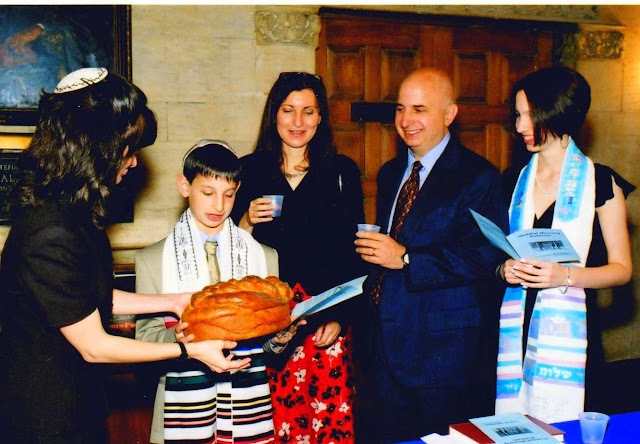 But even better is that Challah in action pix from Peter's Bar Mitzvah.. truly a classic! Thanks, all for your kind comments! Much appreciated. What a wonderful, miraculous discovery! Such a treasure. What a lovely post & I'm so very glad you shared it with us. If I lived close by, I'd want to come over for a bite of challah! That is beautiful bread and a beautiful story. And a great photo of your grandmother, too! Thank you for sharing. Your husband invited me to take a peek at your blog; I think I'm hooked. You seem to bake like I bake and like what I like. I think I've found a new friend. A lovely, lovely story. It was so nice to meet you today - thank you for coming to visit.